Home MMA News The New UFC Legacy Championship Belt Unveiled On Friday Morning! The New UFC Legacy Championship Belt Unveiled On Friday Morning! UFC Disclosed New Legacy Championship Belt For The First ESPN+ Event! Goodbye Fox, welcome ESPN! The new era brings one important modern-looking detail! The new UFC Legacy Championship Belt was unveiled on Friday Morning. It starts its journey this Saturday night in Brooklyn, New York. 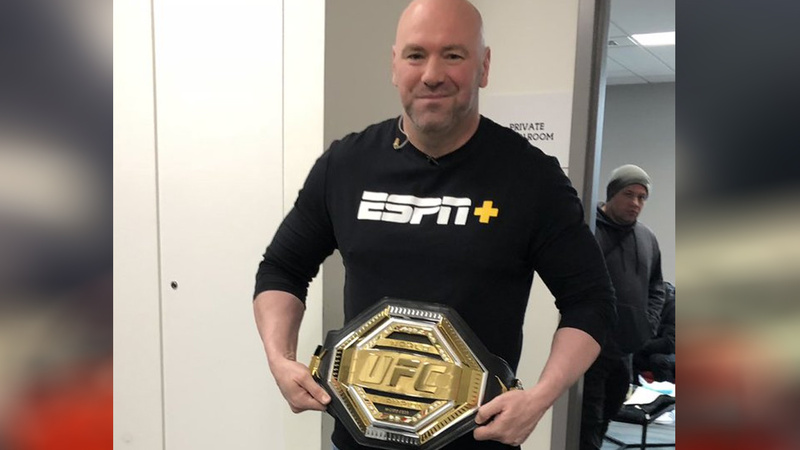 The original UFC title belt hasn’t been replaced since 2001, so this adds a new dimension to the promotional ESPN+ debut! The first man to hold the new modern belt will be the winner of Flyweight title match between Henry Cejudo and TJ Dillashaw. The video shows the most famous division champs – Joanna Jedrzejczyk, Daniel Cormier, Georges St-Pierre, Anderson Silva, Chuck Liddell, and others. But it also looks back at a heroic heartbreaking act of the former UFC Bantamweight king Cody Garbrandt! Check out the photos of new UFC championship belt. Breaking News: @ufc @danawhite with the new UFC Legacy Belt. A new era is here. Introducing the @UFC Legacy Championship Belt. Until now, eight countries produced UFC champions, so the flags of the USA, the Netherlands, the United Kingdom, Brazil, Poland, Canada, Belarus, and Ireland are added on the front plate! Do you like the new UFC Legacy Championship Belt? POS looks like a Fox UFC graphic when going to commercial.